It's been almost two months since we brought Ben home. Seven weeks of sleepless nights, eight bottles sterilized twice a day, five types of pacifiers tested, two bottle cleaning brushes used until they broke, three times being peed on, roughly fifteen thousand diaper changes, and countless "We made him! Look at that face!" exclamations later, I finally carved out some time to write. Before you get nervous - no, this is not turning into a site exclusively about motherhood and recipes for pureeing farm stand cruelty free baby food. I promise not to regurgitate what's been written about by countless others. Keeping this space platitude free is critical. Even as a new mother the last thing I want to read is yet another post about how beautiful motherhood is or how breastfeeding is the most difficult. No kidding. Also, the sky is blue. Bringing Ben home, becoming a parent, it's every single emotion. Exhilarating, inspiring, frustrating, annoying, decadent, surreal... every possible feeling wrapped up into one big one that hits you like a brick flying through a glass window. At first I tried going about things as if nothing had changed - cleaning, cooking, checking email, trying to keep up with life in the same way. But, eventually, I slowed down. Or rather, forced myself to slow down. Trying to keep the same pace as before is unsustainable and not just because we're sleeping only four hours a night. We're settling into this new life and trying to find balance and rhythm in our little family. Below, a few lessons learned and experiences gathered over the last two months, from deep within these sleepless trenches. 1. Sleeping when the baby sleeps is a big fat myth. Unless you have a housekeeper or nanny daytime naps are when it's time for laundry, dusting, cleaning, bottle sterilizing, laundry, dog walking, did I mention laundry? Also, let's be real, when baby naps is the only time to indulge abandoned but well loved previous behaviors such as binge watching Billions while fixing a chipped manicure. Oh, and afternoon naps make me as groggy and grumpy as Ben. Unfortunately, the 5 S's don't work as well on a 33 year old woman. 2. You need coffee. So much coffee. BUT here's the thing - all coffee will remain unfinished. Don't even try to drink a whole cup in one sitting. There will be feeding, burping, swinging, shushing, and swaddling between sips. Thank goodness for the microwave. Learning to enjoy reheated coffee - huge part of the motherhood gauntlet. 3. It is incredible how much can be done while holding a baby in one arm. Two weeks ago I made a full dinner of pasta with meat sauce all while balancing Ben on my hip. There was even a chiffonade of basil involved! I've also watered plants, organized books, even lint rolled a pillow. Maybe when he goes to college I'll take up juggling. 5. Babies sleep better with noise. After two weeks of white noise playing endlessly in the apartment I felt like I was living in the world's most anticlimactic horror movie. With much experimentation we realized Ben falls asleep to Paul Simon. Not just falls asleep - he stays asleep. This was well and good until Paul Simon was playing so often that the mere beginning of "Me and Julio Down by the Schoolyard" made me want to cheerily sashay myself right out of the bedroom window. We had to break up with Paul. We're now firmly planted in playing "thunderstorm" or "rain on a tin roof" sounds through Alexa. (It's really a brave new world when real rain outside your window isn't loud enough to satisfy the fourth trimester needs of a baby.) How long can two adults handle being fake rained on during clear, sunny, June days? Unclear. 6. Every baby movie ever wasn't lying. Boys pee straight up. No more explanation or description of the situation necessary. 7. Hold your breath when taking the diaper bag out of the Ubbi pail. Seriously, it's not worth it to breathe. 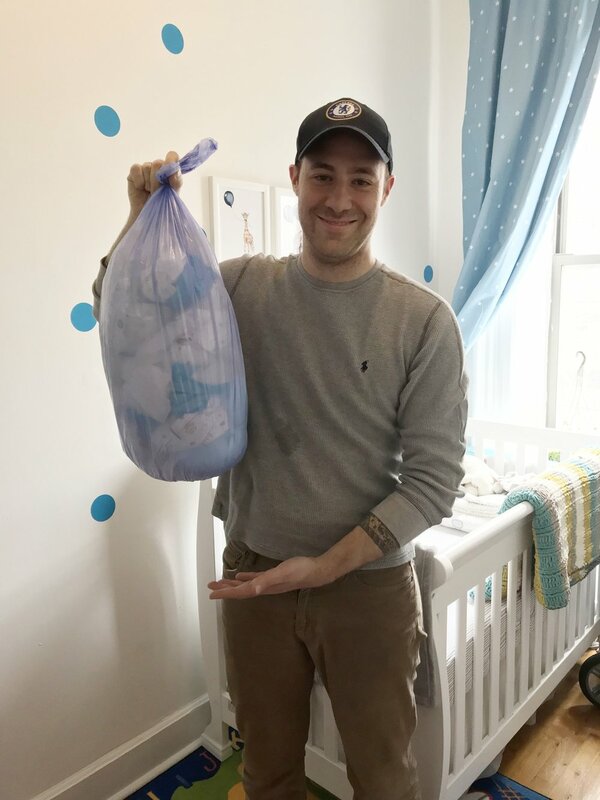 Two days of diapers. two. More to come soon but for now I'm going to go smell my baby's head. bags under eyes brought to you by sleep deprivation and pure bliss.